Mathmos Black & Copper Telstar Rocket Lava Lamp Pink Wax In Blue Liquid Bottle. Height of Lamp including shade: 45cm. Base (ball): 19cm Bottom base of lamp: 13cm. Simple in design, very versatile, this style looks great in any room. Switch: In-Line (on cable). Size of Base Height of base to bulb holder: 31cm. Tripod Material: Wood, Steel & Aluminum. Tripod Finish: Brown Finish. BULB WILL NOT SEND WITH ANY LAMP FOR SAFETY REASONS. Type : Floor Lamp/Corner Light. Although the raw material and resources that we use is earthen ranging from Brass, bronze, copper, steel, wood, Iron & leather. Set of 2 x Modern clear glass table lamp bases with polished copper detail. The polished copper detail adds a trendy modern look to this lamp making it ideal for classic and modern interiors alike. Ready for use with a shade of your choice to match your decor. This lamp is the popular Jack Daniels Tennessee honey bottle. 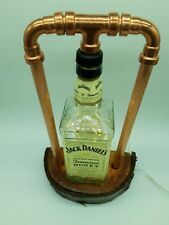 Industrial V Natural- this stunning Jack Daniels lamp includes aspects of both using up cycled materials. The photos show warm white LEDs but many other colours are available. Designed principally as a desk lamp but also used as a side lamp, it is intriguing, detailed and certainly a one off design. You won't find another lamp with the range of accents, quality construction and individual industrial but not decaying presentation. New listingArtisan COPPER CANDELABRA - Contemporary Urban Design - A Statement Piece! SUPERB CONTEMPORARY ARTISAN COPPER CANDELABRA. Five candle holders make this a very practical and attractive candelabra. Finished to a high standard with cork feet for scratch resistance. Modern colour and design, swinging, with adjustable height. Beautiful and stylish floor lamp but too large for my house. We tried it in 2 rooms but my house is too small. It's practically new since I just opened it and assembled to test it. It's just take you 1 minute. It is double insulated for added safety. Length: 1M. Built- Material : Copper. Suitable for use with LED bulbs. Shade Included. Shade Colour (Copper Base Colour/Finish) Black. Shade Material: Fabric. Switch Type: On/Off Switch; Touch. Shade 18cm D x 18cm W x 17cm H. Bulb Included: No. Assembly Required : No. Power Source : Battery Powered. Bulbs Included : Yes. Bulb Cap Type : LED. Battery Type : 3 x AA. Batteries Required : Yes. Batteries Included : No. 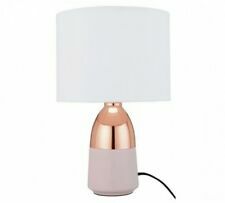 Featuring a light pink and copper contrast, this sophisticated touch table lamp has a classic, never-go-out-of-fashion style. Including a soft fabric tub shade, set it on dim for a warm and alluring glow. It is perfect for interior spaces with an ornate, fanciful and decorative style. Since these are handcrafted products, the exact color of glass pieces may vary. Colors of the glass will appear darker and less vibrant when not illuminated. SET OF FIVE USSR Vintage Pressure Gauges.industrial Home.Steampunk Parts Decor. 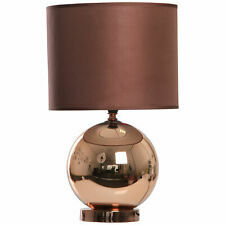 Modern clear glass table lamp base with polished copper detail. The polished copper detail adds a trendy modern look to this lamp making it ideal for classic and modern interiors alike. Ready for use with a shade of your choice to match your decor. Polyresin, multi-faceted base with a copper finish and smooth linen shade. Adds polish and high style to your room. This floor lamp in a modern style is suitable for a contemporary as well as an industrial area. Type: Floor Lamp. 1 x Floor Lamp. Adjustable Standing Lamp. Suitable for LEDs, halogens, energy efficient bulbs. Copper & Grey Fabric. This floor lamp requires a max 60W BC light bulb and is suitable for use with LED bulbs. 1 x Max 60W BC Bulb. Rated 5/5 for service! Technical Details. Chic Tripod Lamp. Type: Floor Lamp. 1 x Floor Lamp. Traditional Design with a Modern Touch. Suitable for LEDs, halogens, energy efficient bulbs. Assembly: Partial Assembly Required. Freestanding, rectangular bath, tub, roll top, overflow system, floor mounted. This is presented as a chandelier style on a single spur with truncated footing which lends robust yet compact proportions. It's very rare to find a piece of art which double up as a fascinating, vibrant, striking Illuminaire which intrigues you with it's many personalities, complex moods and stunning elegance. 32” overall height. Correct shade is pleated silk. Maitland Smith are high quality, limited run, and principally handmade pieces. LED table lamp FEBO 4,5 W bedside lamp reading lamp office lamp dimmable. LED table lamp FEBO 4,5 W bedside table. LED clamp light reading lamp 5W table lamp. Shape / type: Table Lamp. lighting Accessories. copper/rose gold beautiful shade . Condition is New. Dispatched with Royal Mail Signed For® 2nd Class. LAMP TRIPOD STAND SPOT SEARCHLIGHT. 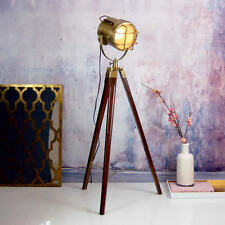 Search Light With Brown Antique Wooden Tripod stand. Color: Brown Antique & Brown Antique Tripod. Usage: Decoration, Floor Search Light, corner lamp, corner corner light. Type: Desk Lamp/Corner Light. Lamp Material: Brass & Aluminum. Lamp Finish: Brown Finish (as shown in picture). BULB WILL NOT SEND WITH ANY LAMP FOR SAFETY REASONS. This is a Reproduction Item, Not Sold As Antique. Polished Copper with White Fabric Shade. Supplied complete with a crisp white fabric shade. It has a lampholder on/off switch and grey braided cable for added detail to this exquisite piece. Requires 1 x 60W BC light bulb - suitable for use with LED. This stylish lamp is lightweight, durable and portable. It can be placed on a table or used as a handheld light. Touching a finger to the top of the light turns it on and off. Perfect for reading at a dark table or set it on the desktop for instant keyboard and workspace lighting. Opened for testing and damaged box and can has some small marks Size H31.5, W20, D20cm. Diameter of base 9cm.Touch sensor switch.IP rating 20Assembly required. No wiring required.Bulbs required 1 x 40W golfball SES small edison eco halogen bulb(s) (not included)(not included). It is mounted on a black coloured solid cast iron base while the bow is attached. Lost of custom made parts on this one making it a truly unique item. Vintage USSR Manometers.Rescue.Salvage.Industrial Steampunk Decor. Steampunk style in industrial interior. -Real colors may slightly differ from their appearance on your display. Produktlinie BLAVIK. Modell Blavik. 1 IKEA BLÄVIK white. Marke IKEA. Lamp glass holder / lens / reflector / screen / enclosure / console / closure: Polycarbonate. Light colour: warm white (2700 k). The lamp can be manually or energy-saving eliminates the 15 min.